The number of murder victims per 100,000 people reported by police departments in selected U.S. cities, for the U.S. as a whole, and for African American men in the U.S. (Click for a higher-resolution version.) Source data is from the FBI Uniform Crime Reporting Program , supplemented by U.S. Census population data. tl;dr: How to promote racial equality? Possible places to start: reducing crime, improving policing, and promoting voting. Racial discrimination continues to plague our nation. This is evident in our workforce (hiring practices, income disparities, opportunities for advancement, etc…), in the administration of our criminal justice system, in systemic efforts to disenfranchise voters based on race, in the relative dearth of substantive environmental protections for communities where people of color constitute a large percentage of the population, and in other facets of American life. What steps can and should be taken to address these issues? First, I think questions like this are ultimately best answered by people who (unlike me) are part of minority populations, since they’re the people most directly affected by the issues under discussion and the people who will have to live with whatever policies get adopted to address them. But Jason directed these questions to all candidates, not all of whom are racial minorities, and all of us as voters will end up weighing the candidates’ answers. So I’ll put my two cents’ worth in as well. Second, although Jason refers to “racial discrimination” in general, my comments are specifically directed to issues relevant to African Americans. Those issues are what most people think about when the subject of “race in America” comes up, and they’re major factors in politics at the local, state, and national level—as they have been for the past two hundred years or more. So given that, what are my own thoughts? As is evident from Jason’s question, questions of race and racial discrimination arise in many areas of life, and it would be overly ambitious of me to try to address all or even most of those areas. I’ll instead focus on a few areas that I think are fundamentally important and where there appears to be good reason to think that improvements can be made. The first two areas are crime and policing, specifically ensuring that African Americans do not suffer a disparate impact from criminal violence, and that measures to reduce crime do not themselves cause a disparate impact on the ability of African Americans to live their lives in dignity and freedom. Reducing crime is fundamental because ensuring the security of its citizens is the first and foremost task of any government. Improving policing is fundamental because we expect our governments in particular to go about the task of ensuring citzens’ security in a way that embodies the ideals of a liberal democracy, as opposed to resembling the practices of a police state, an occupation force, or a paramilitary group. No one should have to live in an environment marked by constant criminal violence. In addition to its effects on individuals, it has a corrosive affect on neighorhoods and cities in which it occurs. Efforts to build communities and promote their economic development cannot be expected to succeed in the absence of adequate security for their inhabitants. Why should we expect progress can be made? Because progress has in fact already been made in some respects, as can be seen in the graph above. Murder is the most extreme outcome of criminal violence, and the rate at which people become victims of murder has gone down dramatically over the past decades. There is still a lot of variability around the country in murder rates. But this variability also shows that there is significant room for improvement at the local level: there are cities that have similarly low murder rates despite being very dissimilar demographically and otherwise, and cities with very different murder rates that we’d expect to be otherwise comparable. So things have gotten better, and could potentially get better still. But could this be done without subjecting minority communities to overly aggressive policing? Just as we can look to murders as representing the extreme end of criminal violence, we can look to police killings of unarmed people as emblematic of citizen concerns about police actions. The number of police killings of unarmed individuals is relatively low when viewed in the context of killings overall, and especially low in relation to the total population. For example, in 2015 police killed 75 unarmed African American men, just over 1% of the more than 7,000 African American men murdered that year, with the chances of any particular African American man being killed by police being extremely low. Some commentators have used these statistics to argue that the problem of police killing African Americans has been blown out of proportion. But even a few killings exert a large influence on people’s perception of police behavior, similar to how even a few terrorist incidents influence political responses to terrorism. For example, as noted above, of all African American men who died violent deaths in 2015, about 1 in 100 were killed by police while unarmed. If we look at men of other races who died violent deaths in the United States from 1995 through 2016, the fraction of those deaths due to terrorism (including the 9/11 attacks) is almost exactly the same: about 1 in 100. If we look at the post-9/11 years the fraction is even lower: Of nonblack men who died violent deaths from 2002 through 2016, only about 1 in 1000 were killed by terrorists, and only about 1 in 2000 by Islamic extremists. The shadow of 9/11 still hangs over U.S. politics, and it’s not surprising that it does: of nonblack men who died violent deaths in 2001, 1 in 5 died in the 9/11 attacks—a number so large it caused the FBI to omit 9/11 from crime statistics for 2001, presumably lest it distort analysis of historical trends. Federal, state, and local governments continue to spend billions of dollars a year to protect Americans from the threat of terrorism, with combating Islamic terrorism the main political focus. But as an ongoing problem today the problem of unarmed African American men being killed by police is an order of magnitude worse than the problem of other men being killed by terrorists in general, much less by Islamic terrorists. Thus it’s reasonable in my opinion for governments to take the necessary actions and allocate the necessary funding (e.g., for better police training) to reduce police killings and other instances of police-initiated violence to as low an amount as possible. Again, the data suggest there is definite room for improvement: Rates at which police kill African Americans vary widely across different jurisdictions (almost by an order of magnitude), and at first glance there’s apparently no strong relationship between rates of killings and overall crime rates. This suggests that many police departments could in fact do their jobs in a way that is both more effective in reducing crime and more acceptable to the communities they serve. Of course, improving policing in this way requires electing officials who are motivated to take the necessary actions to do so. This leads into my recommendation for another key action for reducing racial discrimination and promoting racial equality, namely making sure that the political power of African American voters properly reflects their presence in the general population. This includes a wide variety of issues and actions: registering more African American voters, making sure they’re motivated and able to get to the polls, working against laws and regulations that may have a disparate impact on African American voters, and addressing broader issues like gerrymandering of electoral districts to favor one political party over another. I don’t have time or space in this post to do an in-depth treatment of the controversies around measures like voter ID laws and the like, and render a considered judgement on all the claims and counter-claims that people have made around voter fraud, the need to protect the security of elections, etc. Instead I’ll just “state my priors” and describe the underlying principles I think are relevant here. First, America has a history here, and not a very good one. Arguments advocating (for example) strong voter identification systems and noting their uncontroversial use in other nations would play a lot better if there wasn’t a long tradition of disenfranchising African American voters in various ways, and if present-day politicians didn’t make claims about “massive electoral fraud” far in excess of any potential reality. Thus I would put a significantly higher priority on securing voting systems themselves, including requiring a paper audit trail for all votes, than I would on worrying about whether someone could possibly vote as someone else, vote twice, vote out of their jurisdiction, or vote when they’re ineligible to do so. A final thought: Jason directed his questionnaire at local candidates generally, including candidates for the Maryland legislature, the Howard County council, and the county executive. There’s another set of elections occurring, namely the so-called “courthouse races”. These are for positions that are relatively obscure to most people (for example, Judges of the Orphans Court) and thus don’t receive a lot of attention. However one of these positions is particularly relevant to the issues I’ve discussed above, namely that of State’s Attorney, the person who decides which criminal cases to prosecute and how to go about doing so. Local prosecutors occupy a key position in the criminal justice system. It would be interesting to hear candidates’ thoughts on how best to achieve the twin goals of reducing crime and improving policing, with a view to improving the lives of African Americans in Howard County and elsewhere in Maryland. I found the most interesting analysis of crime and policing issues to be that of Patrick Sharkey, as outlined in his book Uneasy Peace: The Great Crime Decline, the Renewal of City Life, and the Next War on Violence. Of course, “interesting” does not necessarily equal “true”, but I found Sharkey’s treatment to be both not obviously wrong and not overly ideologically biased. “Two Lessons of the Urban Crime Decline”. A New York Times op-ed by Sharkey briefly summarizing some of the arguments from the book. “Uneasy Peace: Supplemental Slides for Empirical Analysis. A slide presentation by Sharkey summarizing the empirical arguments in Uneasy Peace and the supporting data. If you’re not put off by graphs and (a couple of) numeric tables, I think this is the best single expression of Sharkey’s arguments. “The Great Crime Decline: Drawing the right lessons from the fall in urban violence”. Adam Gopnik in the New Yorker magazine. “An ‘Uneasy Peace’ and the Search for Durable Cities”. Edward Glaeser in the Wall Street Journal. “The Counted: People killed by police in the US”. A database maintained by The Guardian newspaper on people killed by police (for whatever reason). It allows filtering by demographic groups, unarmed vs. armed victims, and so on. Mapping Police Violence. A combined data and advocacy site focusing on police killings and related violence. “Better Policing Is the Best Criminal-Justice Reform”. A National Review article by Rachel Wu that encourages conservatives to adopt a “law-and-order, civil-rights reform agenda” based on “high-quality policing” and “diminish[ing] our society’s reliance on incarceration”. “Voting rights in the United States”. This Wikipedia article is a good summary of political controversies over voting rights in the U.S. since its establishment, including attempts to eliminate or dilute the political power of African Americans. “The single most important person to reform the criminal justice system is not…”. An article by Shaun King in which he explains why he’s shifting the focus of his activism to electing reform-minded prosecutors. (He subsequently founded the Real Justice PAC). Finally, for the calculations and data behind the graph above and other numerical statements in this post, see “U.S. 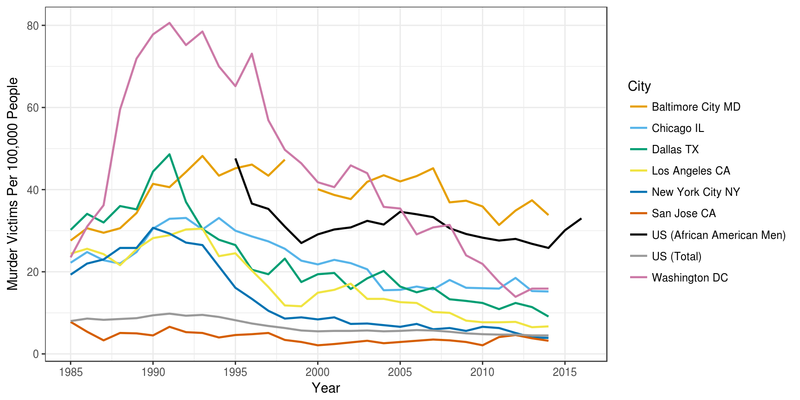 murder rates and deaths from terrorism” and the source code for that article in the seven-answers code repository.